This volume examines the fusion of uncertain, imprecise and paradoxist sensor information. It presents advances in the theory of plausible and paradoxical reasoning, offering an introduction to the fusion of quantitative and qualitative beliefs, a generalization of the classic combination rules to DSm hyper-power sets, and a new class of fusion rules based on T-Conorm and T-Norm fuzzy operators. Then it introduces applications of DSm theory, including definition of continuous DSm models, robot map building from sonar sensors, and human expert fusion for image classification. Editorial. "Fusing Uncertain, Imprecise, and Paradoxist Information (DSmT)." Information & Security: An International Journal 20 (2006): 5-6. Dezert, Jean, and Florentin Smarandache. "Introduction to the Fusion of Quantitative and Qualitative Beliefs." Information & Security: An International Journal 20 (2006): 9-49. Daniel, Milan. "A Generalization of the Classic Combination Rules to DSm Hyper-power Sets." 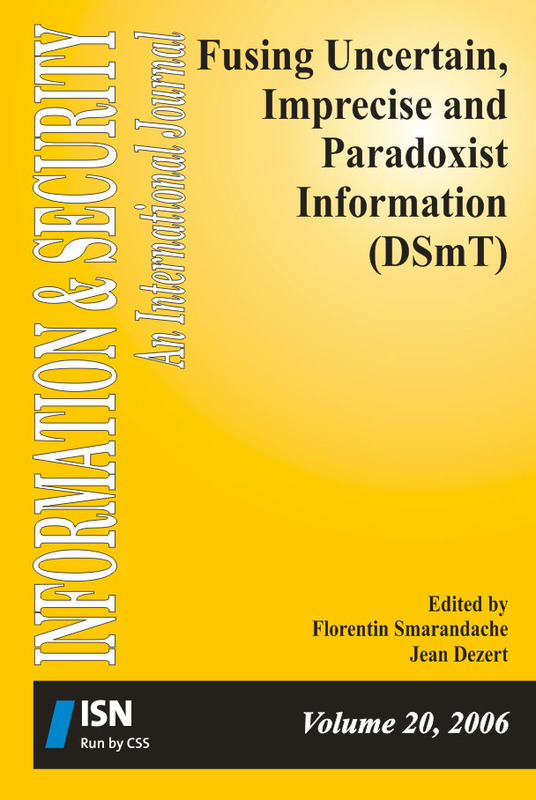 Information & Security: An International Journal 20 (2006): 50-64. Tchamova, Albena, Jean Dezert, and Florentin Smarandache. "A New Class of Fusion Rules Based on T-Conorm and T-Norm Fuzzy Operators." Information & Security: An International Journal 20 (2006): 65-82. Dambreville, Frédéric. "Ordered DSmT and its Application to the Definition of Continuous DSm Models." Information & Security: An International Journal 20 (2006): 85-103. LI, Xinde, Xinhan HUANG, and Min WANG. "Robot Map Building From Sonar Sensors and DSmT." Information & Security: An International Journal 20 (2006): 104-121. Martin, Arnaud, and Christophe Osswald. "Human Expert Fusion for Image Classification." Information & Security: An International Journal 20 (2006): 122-143. Monitor, ISIJ. "I&S Resources." Information & Security: An International Journal 20 (2006): 147-153.